Summer is one of Bonnie Ann's chunky pups. She is an active girl that likes to run whenever it is time to go to bed. She is the first one ready for meal time and loves her treats. 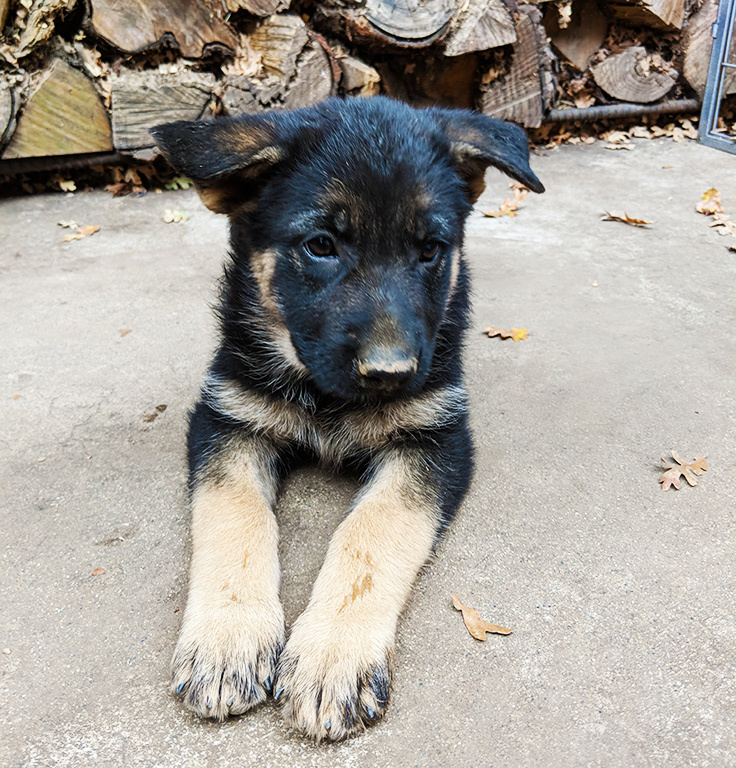 Summer is black and tan right now, it will be great to see her beauty come through. We can help more dogs if we have more volunteers. If you can help in any way, please contact us. 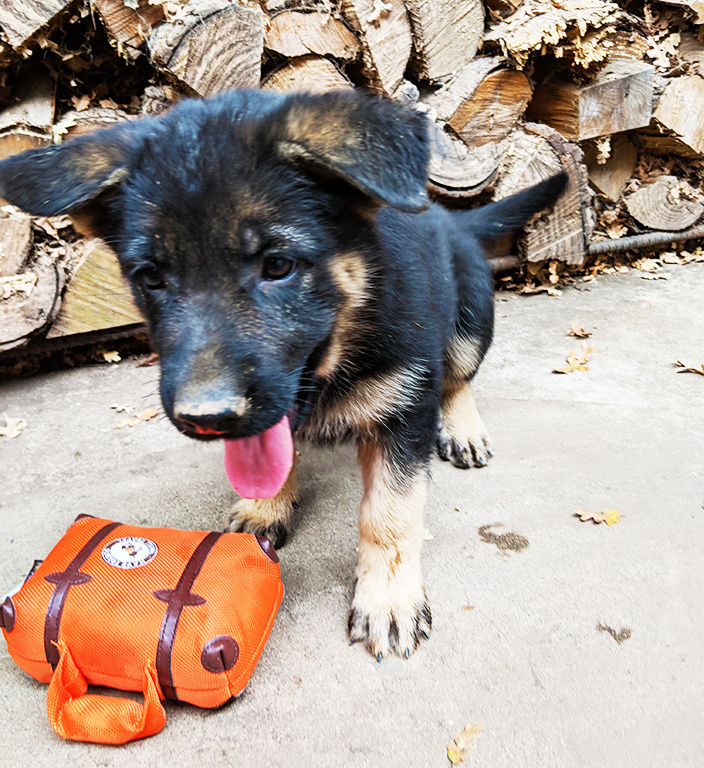 Is a German Shepherd Dog (GSD) right for you? The Dog Rating Levels are based on the GSD’s inherent drives, confidence, attitude and personality. German Shepherds are known as high maintenance dogs. Do not add a GSD to your life if you do not have the time, patience and energy to exercise, train and manage them in interactions with all people and all animals. The higher the Rating Level, the more confident and demanding the dog is, and the more of everything the dog will require e.g. exercise, obedience training, management and supervision. Young dogs under 2 years old will probably mature up a Level when they reach adulthood. Don’t mistake a smaller size for an easier dog! Note: Any dog can exhibit atypical behavior under conditions that are stressful for it. They tend to be willing to go along and get along, and want to avoid trouble. They tend to be gentle, soft, mellow dogs. Usually Low to Moderate Energy. Suitable for senior or novice households. They tend to be a mix of confidence and submissiveness and want to please their owners. Usually Moderate Energy, that can usually be satisfied with daily walks and play or training time. They tend to need some basic obedience lessons, and some supervision and management in certain situations. Can do well in novice homes that provide training and exercise. These are dogs with the standard breed temperament. Confident, assertive and pushy, will challenge leadership status. Independent problem-solvers that will try to out-think their owners. Usually require owners with prior GSD or similar experience or access to trainer assistance. This level of rescue dog are often untrained and physically stronger dogs, but they are highly trainable as family pets. These are not competition dogs nor working dogs. This is our average, well bred, 1-3 year old adolescent dog, especially males. With training, these dogs often mature to a level 2 at the age of about 4 years old. Usually Moderate to High Energy. Need physical and mental exercise, every day including in the rain or snow. 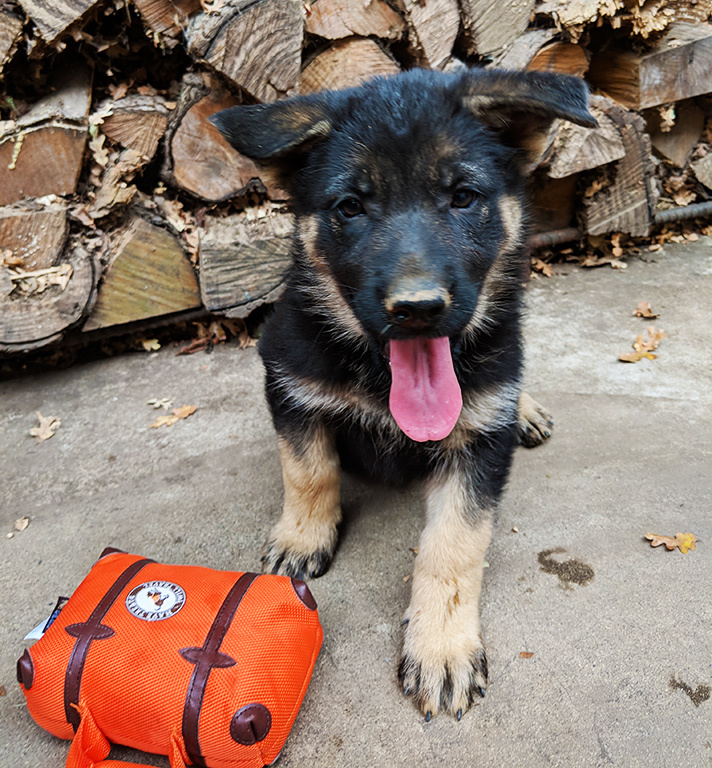 Puppy Level 4: All GSD puppies are Level 4. 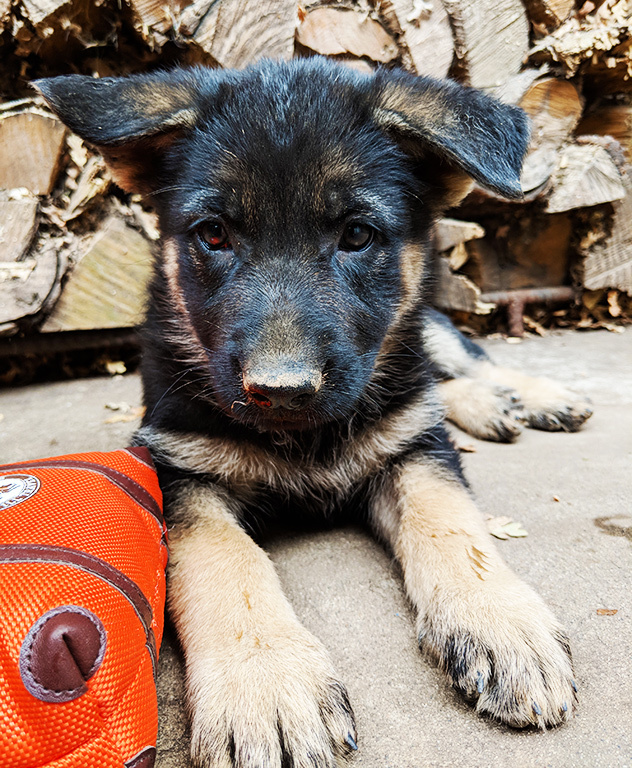 They require owners who are home often enough, and have enough patience, time, energy, and experience to appropriately exercise and train a GSD puppy and make it through the nipping, chewing, digging, jumping up on people, clawing, mouthing, barking and destroying your most expensive items stages, that usually last from 8 weeks to 2 years old. Must have prior puppy training experience. Adult Level 4: Usually High energy. When awake they never slow down This type of dog is highly trainable but is fast, strong, and intelligent with strong working desire. This dog is always ready to work and requires lots of obedience work and play time every day to thrive. Level 4 dogs are usually competition dogs or powerful dogs in need of a job. These dogs live to work for a toy. These dogs are rare in our rescue. Level 5 dogs require professional handlers with the knowledge, experience and strength to keep them under control. Very confident, very pushy, extremely competitive. Usually ball, toy or prey obsessed. Very high drive and high focus, will often scream, whine and nip in frustration to DO SOMETHING, NOW! High Energy, always in high gear. Need several hours of physical and mental challenge every day, live to outwit, outplay and outlast everyone else. Never slow down, never wear out. This type of dog is not a pet and will never be in our program as they are for professionals or top competition dog owners. Golden State German Shepherd Rescue, based in Northern California, is a nonprofit 501(c)(3) public charity and donations are tax deductible.